Organizing studio apartments so that there’s ample room for all the different functions you require in your living space can present all sorts of challenges. 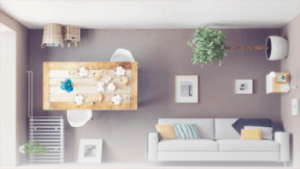 Whether you’re working with a spacious open-plan loft or a micro apartment the size of a typical master bedroom, you still have to determine how to delineate the space for your sleep, work, leisure, bathing, dining and dressing routines. Bookcases, curtains and room dividers can definitely help, but when square footage is severely limited, creative solutions are required. Spanish interior design studio Zooco presents a novel approach using modular wooden inserts that divide the space into zones for each major need, in the order that you need it. 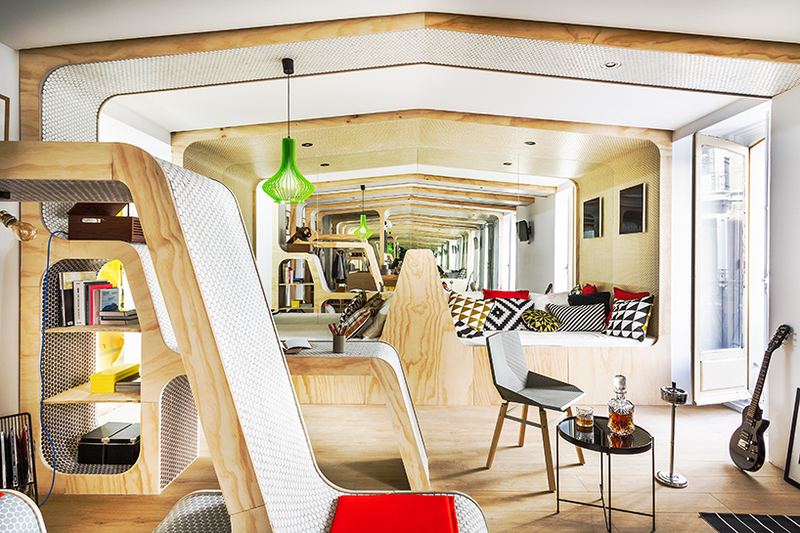 Against one mirrored wall you’ll find a built-in bed and sofa, tucked away so they don’t take up valuable floor space. On the opposite wall, a shower is hidden in the far corner beside a sink and vanity. Taking up the center of the room are three narrow, low-profile, ribbon-like built-in units with three different functions: a desk, a lounge and a closet. The units seem to cascade down from the ceiling, flowing toward the floor in a wave. This shape disguises clutter beneath the tiled surfaces and keeps the line of sight open from one end of the room to the other, making it feel larger. Those floor-to-ceiling mirrors further multiply the space visually. Zooco calls the concept ‘Modulor,’ an organization scheme that pushes private functions against the walls for a protected, cove-like feel while the more public functions are exposed to the sunlight coming in from the front windows. 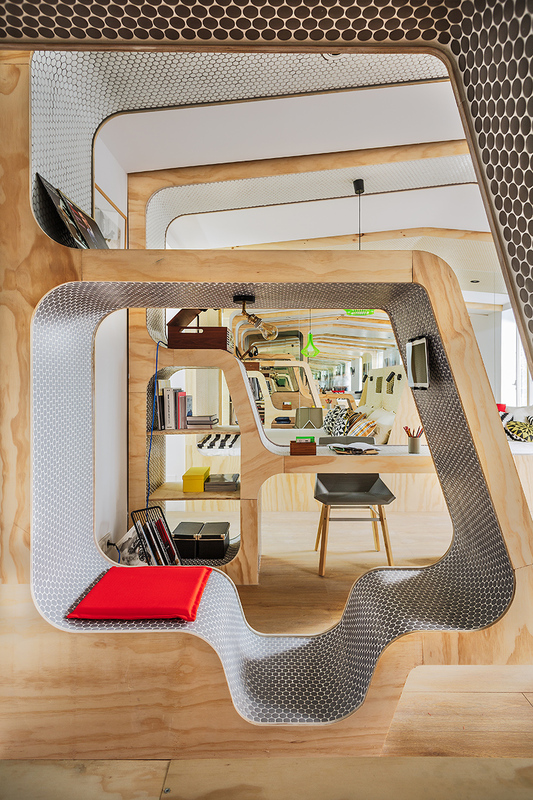 One module offers a flat desk surface with storage and space for a chair underneath, while the second is shaped like a reading nook with room to lounge on the top, inside the nook or on the end facing the windows. 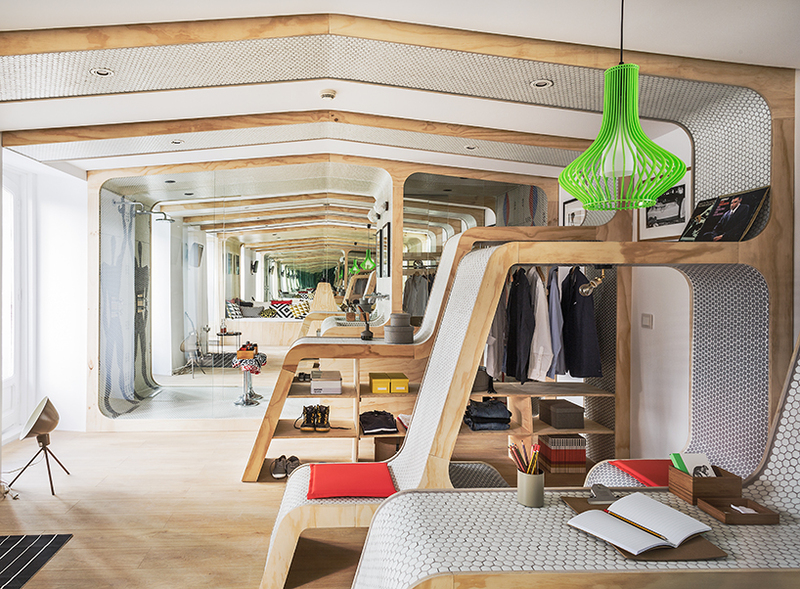 The third module features a clothes rod and shelving. 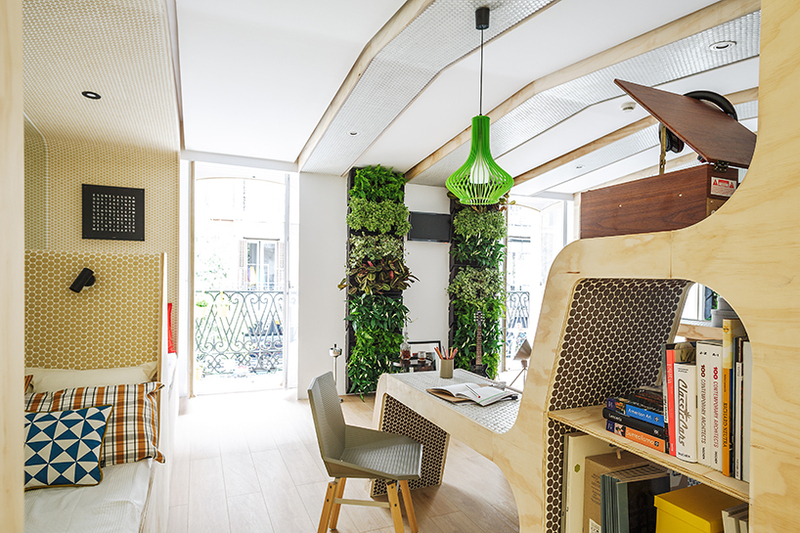 Half of the floor space is left clear for entertaining, working out and practicing guitar, with two vertical gardens giving the entire apartment a lush, vibrant atmosphere. 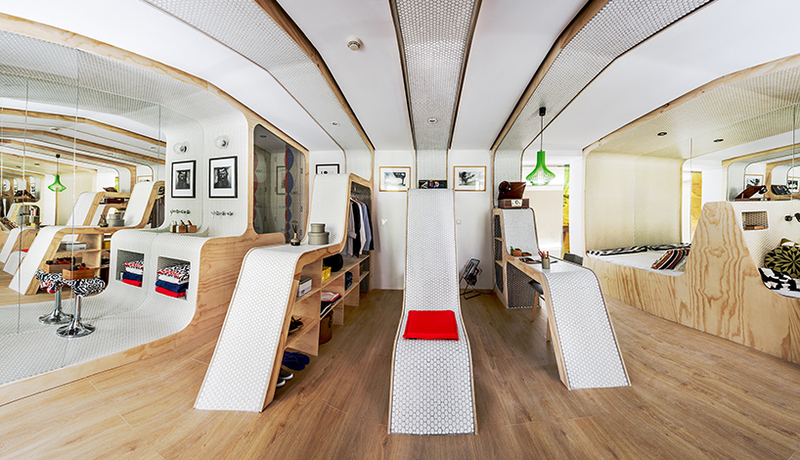 The modules appear to have been custom-created for this 366-square-foot space in Madrid, conforming to the curvature of the ceiling, but it’s not hard to imagine the concept adapting to all sorts of other room shapes and sizes. Sequentially spaced according to this particular resident’s routine, they could be rearranged as needed. The pale wood and circular tiles unify them with the rest of the room, and the overall effect is definitely one of harmony and organization. This particular setup is notably lacking a kitchen, but a fourth module could theoretically be inserted to add that function if the concept was carried over to other apartments. Living in a small space almost always requires careful management of your possessions, since even the most cleverly disguised storage can take up a lot of room. Most concepts for compact urban living focus more on multi-functionality and transforming furniture to make the most of every square inch, but this one manages to maintain dedicated space for all the various residential functions without feeling cramped or cluttered – as long as you’re not a pack rat.